Managing rental properties effectively requires regular inspections of your rental properties to ensure that they are kept in good condition by the tenants. Landlords whom manage their own properties sometimes neglect this important element and assume that the tenant is complying by the terms of the letting agreement. It is best to get a good software system in place or a structure to remind you of pending inspections due or a software system which can automate the collection of the report via a smartphone app. There are plenty of digital inventory apps on the market to choose from. At Swipe Property we use a digital inventory inspections software app which records each element of a property breaking it down to rooms and inside each rooms has fixtures and fittings so there is no ambiguity around the condition of the property upon check in. There reports can be emailed to tenants & landlords and tenants can add comments to sections of the report. It is very important that you setup a schedule of inspections to be conducted during the tenancy with the tenant from the off set. This will remind them that inspections will be done and when. It might be best to put this into the letting agreement. It is standard for letting agents to do the first inspection after 3 months of lease start date and then maybe in month 9 if there had been no issues with the 1st property inspections. 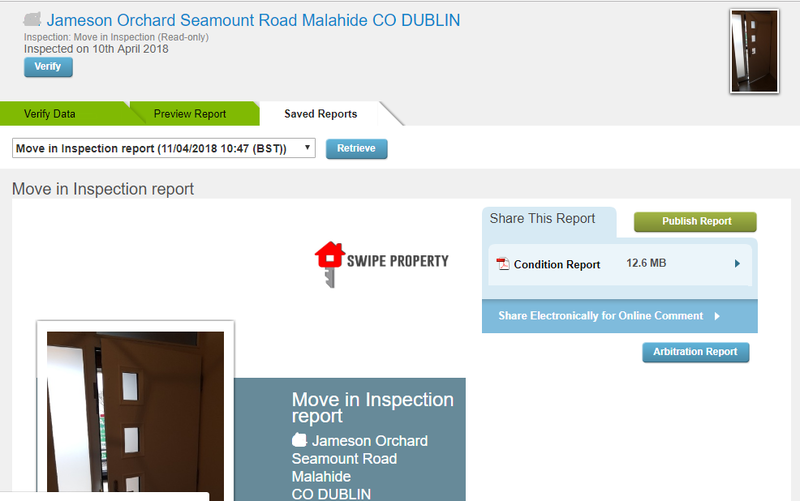 Setting up a schedule of reminders of inspections due is of next importance and most letting agencies in Dublin would have a software system in place to help manage this as you couldn’t rely on your calendar to automate it entirely. The move out report allows for the property to be compared with the condition it was in upon move in. This report is important to compare if there was an issue and it was deemed the tenant left the property in an unsatisfactory condition beyond wear and tear. It can be used in evidence if required at a PRTB hearing and any good letting agency in Dublin should have these two reports on every property encase it goes legal. Further more these property inspection reports are there for all parties to view and comment on helping protect both the tenant and the landlord in the event of a dispute.